Stainless steel monobloc electronic platforms, fitted with stainless steel bending beam load cells. Suitable for weighing in all types of industrial and commercial applications. Standard version is with approved load cell. Fitted with 4 bending beam, stainless steel, approved load cells with IP68 protection from dust and water. Very sturdy monobloc steel tubular structure with fixed stainless steel chequered loading surface. Adjustable, antislip feet and level. Shielded 5m long 6-pin cable with connectors for connection to the indicator. Pit frame for flush floor installation. 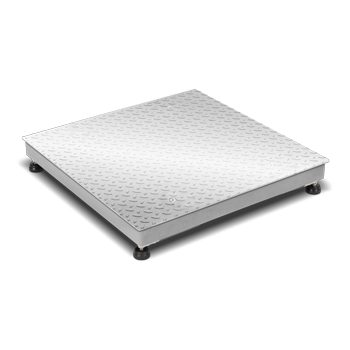 ESITF-1 Stainless steel frame for floor installation for 600x600mm platform.